SonicWALL offers advanced detection and routing techniques for email compliance management, including compliance dictionaries, record-id (pattern) matching, encryption routing, archive storage/retrieval routing, and approval box routing. SonicWALL Email Security enables organizations to meet regulatory requirements, based on government legislation, such as, HIPAA, FERPA, GLBA, or SOX; industry standards, such as PCI; or corporate governance activities, such as data loss prevention (DLP) programs. Financial Terms and Medical Terms dictionaries, which can be edited if desired, are supplied by SonicWALL. Administrators can create or import their own dictionaries as needed. Look for content within attachments including Word, PowerPoint, PDF and 300+ other file types to ensure sensitive data does not leave within attachments. Search for predefined social security numbers, bank routing numbers or credit card numbers. An easy to use Web-based UI enables custom record searches. SonicWALL provides predefined compliance policies, which can be used as-is or modified to fit an organization's specific requirements. 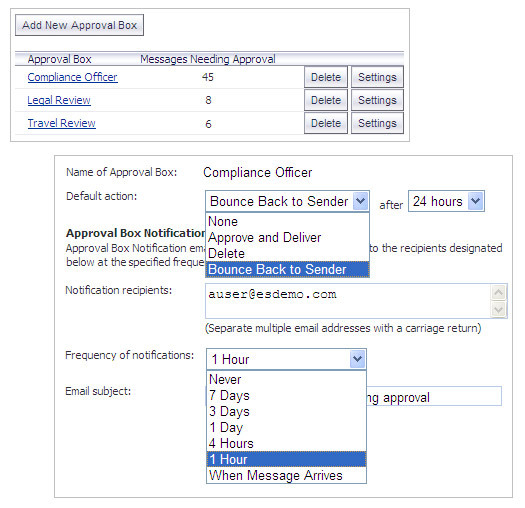 Allow viewing and approval of e-mails that potentially violate compliance policies before they leave the organization. Inbound and/or outbound e-mail can be archived on the same appliance. Or, organizations can route e-mails that match a specific policies to an external archive. SonicWALL Email Security has TLS (gateway-to-gateway) encryption is built in. In addition, E-mail that matches a defined policy can be routed to a third party encryption/decryption server. 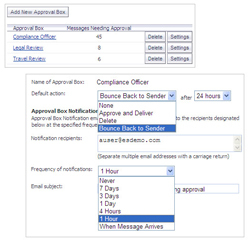 Enable your organization to monitor and report on compliance-related e-mail traffic. The compliance management features on this page are accessible by activating the SonicWALL Email Security Compliance Subscription service on a properly licensed SonicWALL Email Security appliance or software system.